It’s the First of October, temperatures are cooler and fall-like, and that means it’s now acceptable to showcase pumpkins! 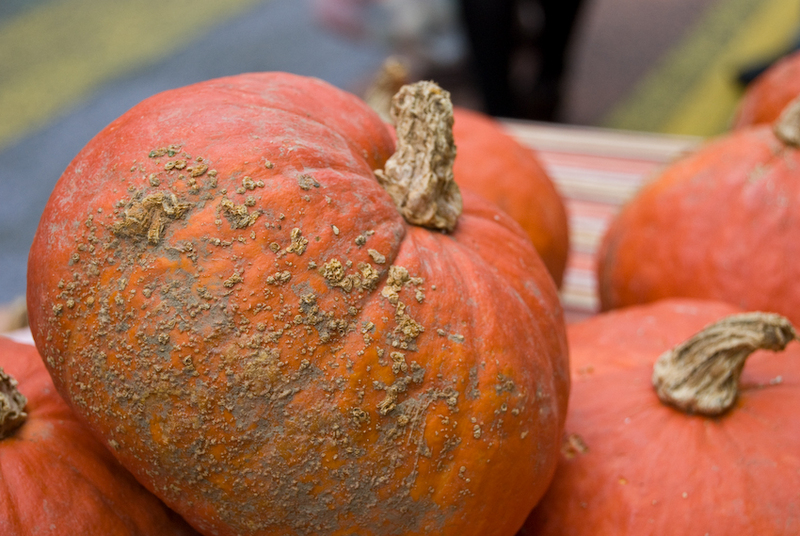 Pumpkins are the quintessential sign of autumn. They invoke memories of hayrides, pumpkin patches, leaves changing color and delicious smells wafting from the kitchen. ‘Tis the season to make some new pumpkin-scented memories with these easy and delicious recipes. Like other types of winter squash, pumpkin is rich in beta carotene, an antioxidant and form of Vitamin A. While it is best known for its presence in sweet treats, pumpkin is low in calories and a good source of potassium, fiber, and Vitamin C. In baking, pumpkin puree can often be substituted for oil to provide moisture (as can applesauce) to save on fat, and increase nutrients. Do you find yourself running to Starbucks Coffee more often at this time of year for their Pumpkin Spice Latte? We found a DIY Pumpkin Spice Latte recipe on TheKitchn.com that will save you a trip to the coffee shop. In a saucepan combine 2 c. milk (soy, 2%, whole, etc. ), 2 tablespoons canned pumpkin OR 1 teaspoon of Torani Pumpkin Spice Syrup and 2 tablespoons sugar or sugar substitute (you can halve this amount to your taste) and cook on medium heat, stirring, until steaming. Remove from heat, stir in 2 tablespoons vanilla extract and ½ tsp. pumpkin pie spice (or a blend of nutmeg and cinnamon), transfer to a blender and process for 15 seconds until foamy. If you don’t have a blender, whisk the mixture really well with a wire whisk. Pour into a large mug or two smaller mugs. Add 1-2 shots espresso (about 1/4 cup of espresso or 1/2 cup of strong brewed coffee if you don’t have an espresso machine) on top. If you like, you can top it with whipped cream and a few dashes of pumpkin pie spice. Because a second recipe makes this post twice as nice, here’s a Pumpkin Bread recipe from Lauren Miller, one of our faithful readers in Gunter, Texas. Oh, wait, she said that it’s her family’s recipe and she’s not giving it up. What about Stacey’s Grandmother’s recipe? Yeah, you’re not getting that either. But Cooking Light and Sunset have a couple of delicious recipes, so try those out and let us know how you like their takes on this seasonal treat! What are your favorite pumpkin recipes? And what recipes will you absolutely never give up to anyone outside of family? Please leave us comments! How Stacey Got the Shot:.At the Penn Quarter Farm Market with the ‘kit lens’ at 55mm, f/5.6 in 1/60 second at ISO 400. We make pumpkin chocolate chip cookies every year around this time. Although they look like traditional cookies, they actually have the texture of cake–moist and dense. I’m sure I’ll probably post the recipe on our blog in the next month or so. Also, as a kid, my mom would always make some kind of hearty, comforting soup and would serve it in a big pumpkin before we went out trick-or-treating on Halloween. I always thought that was really neat. Here’s my family’s Pumpkin Bread Recipe. Grease loaf pan lightly with crisco or any oil spray and dust with flour. Sift first 6 ingredients together. Mix egg, pumpkin, and raisins together. Gently combine wet and dry ingredient mixtures. Bake at 350 degrees for 55 minutes to 1 hour 10 minutes – tester should come out clean. This can also be made in individual loaf pans so each person can be served an entire loaf on their bread dish, or in regular or mini muffin pans. Just adjust the baking time accordingly. Enjoy – this is always a treat!! !